USMC Sargeant Stubby, hero and veteran of WWI courtesy of the US National Archives. In 1916 the United States was deep in a conflict that changed the world. A time of innocence and idealism would collapse in the face of WWI. As areas of sporting events, education and otherwise peaceful intentions were pressed into service by the military, a group of students participated in military training in Yale Field and were joined by a charming, happy Bull Terrier, one we would quickly identify as a Pit Bull today. Stubby, as he came to be known for his chunky body and good sense of humor, was an endearing mascot and treasured companion, so when the young men were reassigned to Newport News for final training before deployment, they couldn't abandon him. While most of the troops would be in vehicles for mass transport that wouldn't hide a dog effectively, Corporal J. Conroy would be traveling in a supply car. This provided a real option for hiding the dog and bringing him with them. Corporal Conroy initially declined then the savvy soldiers introduced Stubby to him. His resistence melted in the face of Stubby's kisses. Thus began a friendship that would serve both Corp Conroy, the company of soldiers and Stubby for the duration of the War. From Newport News, Stubby was smuggled to Europe with his friends, this required the complicity of others since the US did not have a military dog program at the time and if they had, Stubby had not been trained for duty so it is questionable that he would have been included. Trained or not, Stubby made himself of immense service. It is difficult to say how many soldiers returned home due to his alerts over gas attacks (he could smell the gas in time for the soldiers to get their masks on) or when he identified and captured (by the seat of his pants, no less) a German spy. Stubby didn't always benefit from his actions though. He was seriously poisoned by gas at least once (none of the gas masks could be fitted for him) and nearly killed by a grenade (but instead recovered and rejoined his fellow troops). He even saved a young girl while in Paris. Stubby suddenly bolted from Conroy's side and knocked a girl away from a street corner, out of the path of a careening car. While they were grazed by the car, neither was seriously hurt. The people of France were enamored with Stubby, his loving attitude which hadn't changed since his days training with the soldiers in Yale Field, and his heroism. The ladies of a French town near where they were stationed fashioned a special coat for Stubby that could display his many awards, medals and commendations. One of those would have been his honorary title of Sargeant in the United States Marine Corps. USMC Sargeant Stubby with his many medals, commendations courtesy of the US National Archives. Despite his heroism and bravery, Stubby somehow managed to retire from his unofficial military service in 1919. After 18 months in the European front, it would seem that the excitement was over. But no one asked Stubby! When Corporal Conroy attended Georgetown University Law School, Stubby became the unofficial Hoya mascot. His antics of playing with the football not only served to be entertaining but initiated a line of canine mascots to follow and is even credited with beginning the half time show. Stubby still found time to be received by not one but two Presidents (he'd met President Wilson during the War and offered his well known salute to Wilson's delight), Calvin Coolidge and Warren Harding at the White House. He led many parades and attended military conventions and conferences. Corporal Conroy perhaps uttered the most telling and accurate quote regarding his friend when he was nearly denied service at the Grand Majestic Hotel in New York City because they wouldn't accept the dog. With a grumble that might have been worthy of Stubby facing a German spy, Corporal Conroy is reported to have said "This is no dog. This is a war hero!" Stubby was then received and signed the guestbook with a pawprint. 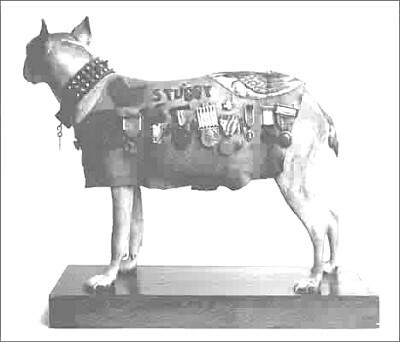 Stubby was more than a military dog or war dog as demonstrated by the full review of his life, he was an envoy and an ambassador both for dogs and the United States Military. For those people who had suffered at the hands of a conquering power, the sense of relief was made all the more real when the invaders were repelled by a friendly force who came forth with a dog offering kisses. In 1926, after a life worthy of several movies, Stubby died. His remains were preserved and are still maintained (along with his "uniform" made by the French ladies and his medals) by the Smithsonian Institution of Washington, DC. Currently he is on loan to the State of Connecticut. 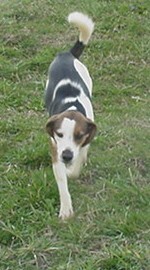 Stubby was extraordinary but he was not outside the potential of many dogs of his heritage. The Pit Bull, Bull Terrier and similar breeds were the result of breeding by farmers to produce an exceptional all around dog. These dogs were nannies and playmates to the children, protectors of the farm, assistants to the farmer in duties as wide ranging as herding to rat killing to carrying money back from the market. This demanded a dog of uncommon intuition and judgement, affability, desire to be around people and clearly, intelligence. It is important in an age when those characteristics can be just as easily distorted by unethical people, to realize that the nature of the dog is not the source of the issue but rather it is an abuse of that very nature that results in an unreliable Bull Terrier. 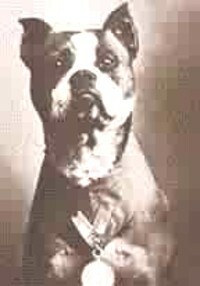 As Stubby's life indicates, he was likely responsible for saving as many (if not more) lives during WWI than "Pit Bulls" today are said to have taken. As a member of Connecticut's Footguard, Stubby is recognized as a valued hero, member and among the first US Military dogs serving as a sentry, courier and a casualty dog. To say his training was informal is an understatement. In fact, Stubby was originally allowed to stay as a mascot because he knew how to 'salute'. Later, from his own desire to help, innate skill and intuition he developed the skills that resulted in the saving of many soldiers' lives. My total joy is boundless!